This is a comprehensive list of vector games on television and movies. Fast Times at Ridgemont High-Star Castle and Tempest at "Ridgemont Mall"
Due to preparing a wiki page for Arcade preservation for The Greatest American Hero "Wizards and Warlocks" episode today, I figured I would start this. I'm sure the list is pretty small right now when the arcade boom was ongoing, but this is all I can come up with right now. In Android, I guess Vectrexes are back and built into spaceship bridges? 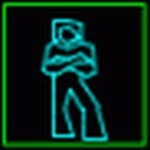 Or was Max 404 just playing Star Trek: the Motion Picture on an emulator with a suspiciously Vectrex-like joystick? In the Charles in Charge pilot, Mine Storm is being played (the Minelayer can be seen during a shot), but the game involved "killing Martians"; yeah, right. In the Joysticks movie, Battlezone and I think Star Castle cabs can be seen. In some episode of Metalocalypse, there's an unnamed vector game in their arcade, where a band member is shooting at vector tanks with a machine gun (yeah, sure!). In the Nightmares anthology, during "The Bishop of Battle", Starhawk is seen in the arcade (which Emilio Estevez [sp?] blew up near the end). Tempest and I think Asteroids are seen throughout the run of Silver Spoons. On some episode of The Outer Limits (one of the later, and not original incarnation of the show), Asteroids is seen in a bunker. And on The Greatest American Hero "Wizards and Warlocks" episode, Star Castle, Armor Attack and Tempest cabs are seen. It's a low blow for Tempest to not be shown though, as the Intellivision game of Advanced Dungeons and Dragons is showed instead that is supposedly being played! Ouch. I also need to go through my copy of the Chasing Ghosts documentary, as I assume there's at least one vector game in there, but I could be wrong. Android, of course, also has the custom written for the film animation code for scanners and radar. As the film was made in 1983, then they are all real Vectrex consoles in the bridge. As the film was made in 1983, then they are all real Vectrex consoles in the bridge. Well yeah, but there aren't going to be *real* Vectrexes built into a spaceship bridge in the future! I also recall there being some news broadcast back in the day about a kid who broke the Star Castle world record, making a million or something. It was crazy seeing those buzz bombs (or whatever they're called) circling around the screen at breakneck speed! I did a bit of updating with the first post, what with catching an episode of last season's Big Bang Theory and finding an arcade in the basement of a house of one of Penny's professors. Tempest and Asteroids were there, but as a bonus, I was surprised at some very obscure old other raster games that were there as well, such as Shark Jaws, Computer Space and Atari's Gotcha. They were in pristine condition (it looked like) and must've been on loan from a local preservation place or something when the episode was shot. Also, I had looked up and since re-watched a Gimmie a Break! episode that I recalled as a kid that had an arcade in it. They had a Tempest and Asteroids cab, although Asteroids was renamed as to being "Froggy Hop" (but it was obvious what the game really was if you're familiar with the cab) and Tempest was supposedly a Missile Command-like game with the dialog two kids were exchanging as they were playing it (but then in another shot it was obviously Tempest). Nothing to see here. Move along. https://youtu.be/5NNOrp_83RU . Info from my post in fb | Vectrex fans unite! What does the sticker on the top of the Vectrex say? "If you're looking at this and thinking 'humph, I'd rather be playing Intellivision', then up yours."